In June 2003, the hopes, aspirations, and careers of Europe's Mars scientists sat atop a Russian Soyuz - Fregat rocket in shape of the Mars Express spacecraft. Mars Express weighed in at just over 1000 kg at the time of its June 2, 2003, launch, with a third of that weight representing propellant to slow the probe down upon its arrival at Mars at Christmas the same year. Just 116 kg was made up of the scientific payload of 7 instruments for conducting a range of investigations in orbit around Mars. The original nominal mission period of one Martian year (687 terrestrial days) has since been extended. Some of the observers no doubt casted their minds back to a similar day in November 1996. Then several tens of millions of dollars worth of European scientific instruments and many hours of dedicated scientific endeavor were lofted towards Mars as part of the complement of experiments aboard the ambitious Russian Mars 96 probe. Unfortunately, 24 hours later their dreams, along with Mars 96, were lying at the bottom of the Pacific Ocean after a failure of the Block D upper stage of the Proton launcher to boost the probe into the proper orbit. However, the Soyuz-Fregat launcher had already proved itself by launching ESA's CLUSTER satellites during the summer of 2000. The European Space Agency (ESA) then decided to support a further attempt to send Europe to Mars, but funding restrictions meant they had to apply their equivalent of "faster, better, cheaper", a so called Flexi-Mission, with a funding cap of 150 million Euros. This meant that ESA had to make many savings by reusing available hardware, adapting new management and design practices, and minimizing the launcher costs. Indeed, the Mars Express spacecraft shares nearly 80% of its design and components with the Rosetta spacecraft, and elements of the solar array structure are taken from the Globalstar satellite series. In addition, several of the scientific instruments fitted to Mars Express are spares or modified designs from the experiments lost aboard Mars 96. Unlike NASA's Mars Global Surveyor mission, Mars Express circles Mars in an elliptical 250 km x 11500 km orbit, inclined at 87 degrees, with imaging restricted to the period of closest approach to the surface. This orbit is a consequence of the payload constraints, restricting the amount of propellant carried and the fact that Mars Express, due to its construction, is unable to use the aerobraking technique to circularize its orbit as was used by NASA's Mars Global Surveyor. Several of the payload experiments are studying the martian space and atmospheric environment, in particular the abundance, distribution and behaviour of water vapour (ASPERA, MaRS, PFS and SPICAM). Other experiments image and analyse the surface of Mars including HRSC, a colour stereoscopic camera that has a resolution of 2m and OMEGA, an infra-red spectrometer that studies the Red Planet's mineral composition. Probably the most important discovery by Mars Express is perhaps water on the Red Planet. The HRSC has taken images of polar ice caps made of water ice and the spectrometer has found evidence of a supersaturated atmosphere, among other water findings. Mars Express also carries a British-built lander called Beagle 2. This small probe, weighing just 60 kg, separated from the spacecraft shortly before orbital insertion and was intended to land in the Isidis Planitia, a flat lying basin in the northern hemisphere of Mars. Beagle 2 carried an array of instruments including stereo camera and an analytical system to seach for organic molecules under the martian surface, but unfortunately contact was lost before the lander ever became operational. Europe launched its contribution to the growing international flotilla of spacecraft that arrived at Mars in 2003, another onslaught by humankind to unlock the secrets of the Red Planet! 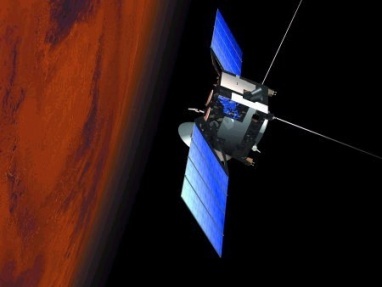 Despite the failure of Beagle 2, Mars Express is currently making great discoveries at Mars.